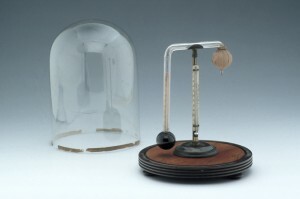 Daniell’s Hygrometer, by J. Newman, London, c. 1820-1850. 10241 Container from rain gauge. 30481 Mason’s Wet and Dry Bulb Hygrometer, by Pastorelli, English. 11292 Snowdon Pattern Copper Rain Gauge, British?, Mid-20th Century? 10772 Copper Snowdon Pattern Rain Gauge. 61478 Whirling Hygrometer, by Casella, London, Mid to Late 20th Century. 91652 Daniell’s Hygrometer, by J. Newman, London, c. 1820-1850. 13350 Pocket Nephoscope, England?, Early 20th Century. 13351 Admiral FitzRoy Weather Glass, by Watson Brothers, London. 74297 Pilot Balloon Slide Rule Mk IVA, English, 20th Century. 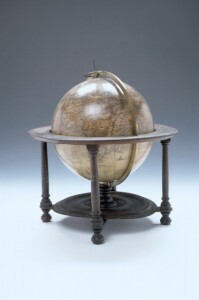 15341 Mercury Barometer and Spirit Thermometer, by Thomas Heath, London, c. 1720-50. 33317 Diptych Dial, by Hans Georg Herttel, German, 1678.